Trash Can May Be Greenest Option For Unused Drugs : Shots - Health News Drug take-back programs are gaining popularity as a safe way to dispose of extra prescriptions. But a study from the University of Michigan suggests that chucking them in your household trash may be just as safe and more environmentally-friendly, thanks to reduced overall pollution. Surplus and expired drugs collected during the DEA's fourth National Prescription Drug Take-Back Day. New research suggests it might be better for the environment to dispose of drugs in household trash. American homes are filled with unused prescription drugs. Each year we squirrel away 200 million pounds of pharmaceuticals we don't need anymore, according to some estimates. Left in medicine cabinets, those drugs can end up in the hands of children or others who really shouldn't be taking them. Proper and timely disposal can avert those problems. Flushing or trashing drugs has been the norm for decades, but take-back programs have been springing up at pharmacies and police departments lately. The Drug Enforcement Administration has organized four nationwide take-back events since 2010. The most recent, in late April, collected more than 500,000 pounds of unwanted medications. Of course, any disposal method has environmental consequences. Flushing, for instance, has fallen out of favor for all but a handful of drugs because of concerns about water contamination. And researchers at the University of Michigan, writing this week in Environmental Science and Technology, say they've determined that trashing drugs, paradoxically, may be the most environmentally-friendly option. People brought medicines to our [April] take-back that had been sitting in drawers, I kid you not, for 40 years. "It's surprising to find out that even though there's this push towards take-back, trash seems to be the best option for several different reasons," lead author Sherri Cook, of the University of Michigan department of engineering, tells Shots. The researchers looked at the overall environmental impact of three disposal methods — flushing, trashing and incineration. They included how much of the drugs would enter the environment, but also looked at emissions impacts from transportation, water treatment, and burning of waste materials. Their results show that flushing allows the highest levels of drugs to enter the environment by far, and creates more air pollution than trashing. Drugs collected by take-back programs are incinerated, which means none of the medicines themselves enter the environment. But the programs produce much greater emissions of greenhouse gases and other pollutants than either flushing or trashing. That's due in large measure to travel: people have to travel to a drop-off point, and then the collected drugs are shipped somewhere for incineration. Cook says one benefit of home disposal is that we already have an infrastructure for collecting household trash. There's also evidence from Sweden, which has had a drug take-back program for decades, that participation stagnates at around 40 percent of consumers. At those rates, Cook's research suggets the drugs getting into the environment would be about the same as if everybody threw them out at home, while producing three times as much pollution. But Barbara Carreno, a DEA spokeswoman, says collection programs bring in people who otherwise might never have disposed of their old drugs. 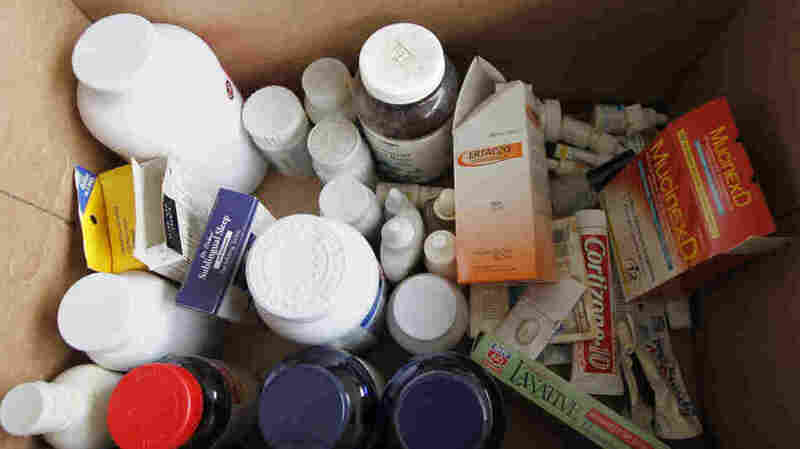 "People brought medicines to our [April] take-back that had been sitting in drawers, I kid you not, for 40 years," she says. The FDA and the Office of National Drug Control Policy provide guidelines for safely disposing of drugs at home, which will be useful to those who don't want to wait that long - or who just like feeling green.